Many of you D-Heads and Disney Fans know every nook and cranny of the Disney Parks. And with all the awesome podcasts and websites out there we always uncover some more. I can’t go a day without learning something new about them. And now for you Disneyland lovers there is a new book that hit the market that will uncover more hidden gems, close up shots and more. 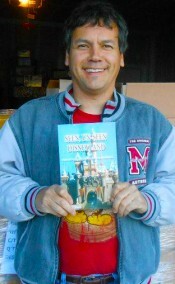 This being the newest addition to Disney Books to read in SEEN, UNSEEN DISNEYLAND by Russell D. Flores. FORWARD: Disneyland is a magical place that has layers of multiple surprises and experiences that captures our attention and excites our senses. Russell’s new book reveals the back stories and the little details that you might not be aware of, that makes Disneyland so special. He has made multiple trips to the park to photograph and document his findings. As a annual passholder, who has been to the park over 250 times, I can tell you that I have learned many new things and was happy to revisit many familiar things to me. Disneyland Seen and Unseen will delight any Disney park enthusiast. If you want to add that something special to the book as a present or for yourself, the author will sign the book for you as well. He will personalize it before it ships off to make it extra magical. If you would like to place a pre-order and get it in time for Christmas email the author at: seenunseend@surewest.net. And a Paypal invoice will be sent off to you. You can also pay with Credit Card through paypal without a paypal account so fear not. You may also pay by check or money order but please email the author as noted above about the steps for that direction.